Nearly one thousand international students, ready for the autumn term, will soon be arriving in Linköping. Far from all of them have somewhere to live. You can help by renting out a room, for a longer or shorter period. 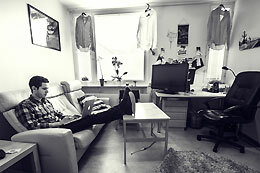 When the international students arrive, LiU – together with student housing agencies Studentbostäder and StudentBo – will be able to guarantee about half of them accommodations. The shortage of accommodations hits international students particularly hard, since they can not be here to look for housing in advance. Many private landlords also give lower priority to people who do not have a Swedish personal identity number. It can also be particularly difficult not having anywhere to live when you have come from far away. The international students are very important for the development of the University and our region in general. The International Office therefore urges you to take the opportunity to rent out a room or a flat, short term or long term. You get an international presence in your home while providing an invaluable service, as well as getting some extra cash. All the information can be found on the KOMBO website, for example how much rent you can charge, how to arrange things with your tenant, and how to draw up a rental contract. On the website you can also advertise, print out contract templates and contact students looking for accommodation. There are also contact details if you want to ask KOMBO questions directly. You can also contact Catarina Lorin, catarina.lorin@liu.se or Karin Gibson, karin.gibson@liu.se at the International Office.